I’m happy to report that we arrived safely this morning at the Marco Polo Airport and are now in Venice. We had a nice view of the Alps this morning. 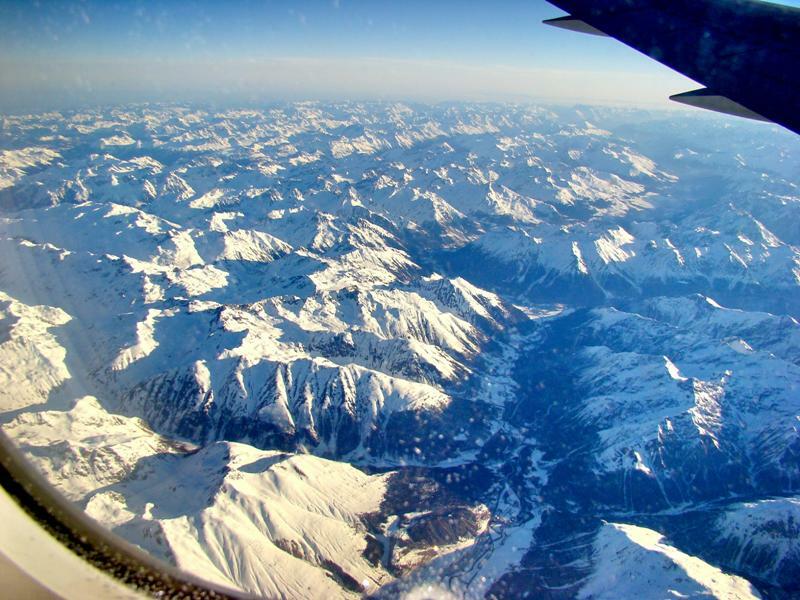 The Alps form a natural border of northern Italy. View of the Alps prior to descent at Marco Polo, Venice. Photo by Leon Mauldin. Today begins our tour of Italy in which my group will see significant sites starting from the northwest, our current location, and working our way to the south of Rome. This morning we arrived ahead of schedule, and some hours before the rooms at our hotel would be ready. 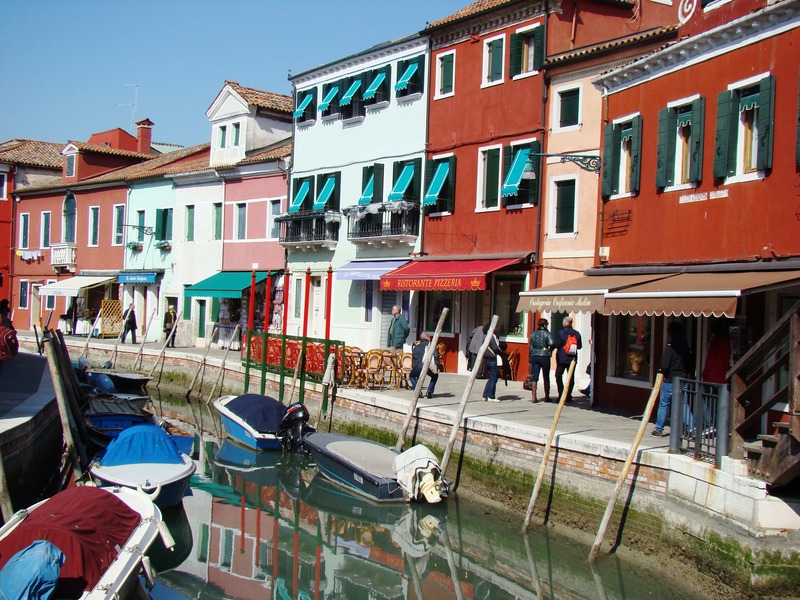 Our guide, Gloria Marchena, from London, suggested we might want to make use of that time by doing an excursion to the nearby island of Burano, one of the islands of the Venetian Lagoon. We opted to go there; about a 45 minute ride by a Venetian motorboat. The island has a population of about 3,000, and is known for its brightly colored buildings and its lace. Burano, colorful island near Venice. Photo by Leon Mauldin. The island was probably settled by the Romans, and in the 6th century was occupied by people from Altino, who named it for one of the gates of their former city. Two stories are attributed to how the city obtained its name. One is that it was initially founded by the Buriana family, and another is that the first settlers of Burano came from the small island of Buranello, c. 8 km to the south. Although the island soon became a thriving settlement, it was administered from Torcello and had none of the privileges of that island or of Murano. It rose in importance only in the 16th century, when women on the island began making lace with needles, being introduced to such a trade via Venetian-ruled Cyprus. When Leonardo da Vinci visited in 1481, he visited the small town of Lefkara and purchased a cloth for the main altar of the Duomo di Milano. The lace was soon exported across Europe, but trade began to decline in the 18th century and the industry did not revive until 1872, when a school of lacemaking was opened. Lacemaking on the island boomed again, but few now make lace in the traditional manner as it is extremely time-consuming and therefore expensive. Everyone is tired, but well. I hope to make posts each evening, so check back as we progress. This entry was posted on Tuesday, March 13th, 2012 at 4:13 PM and is filed under Italy, Travel. You can follow any responses to this entry through the RSS 2.0 feed. You can leave a response, or trackback from your own site. Be sure and tell Danny Parris that he better behave this time without me to help keep his straight!! 🙂 Kathy, Kevin, and I wish we were there with you. uh, that should be RANDY Parris….Danny Parris is a former co-worker. Randy & I both knew who you meant.